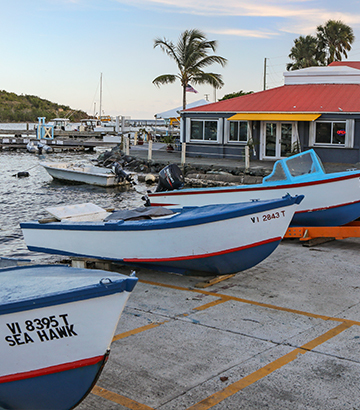 For over 30 years, Hook Line & Sinker has been the premier seafood restaurant in St. Thomas! We’re well-known for our extensive menu of seafood, steaks and more, as well as drink specials and our fun-loving atmosphere. Stop in today for fresh fish, locally-distilled spirits and an all-around delightful time! Hook Line & Sinker is a casual eatery that enjoys providing our guests with a light-hearted, Caribbean atmosphere! 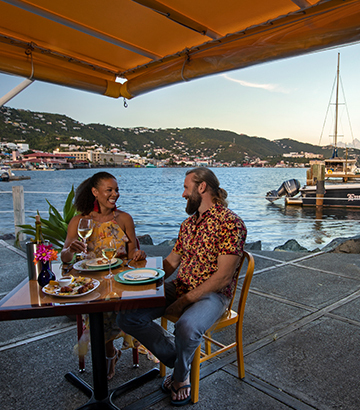 Pull up a chair for breakfast, lunch and dinner and we promise you’ll find a menu that’s full of delicious options, including seafood, steaks and all types of authentic Caribbean food, along with salads, fresh soups, burgers and more. Some of our signature dishes include local fish and fungi, coconut curry lobster, creole snapper, almond crusted yellowtail, bacon wrapped filet mignon, New York strip steaks, king cut prime rib and vegetarian paella. Plus, we’re the go-to brunch restaurant in St. Thomas on Sundays for a huge brunch spread, as well as on Fridays for a full Thanksgiving turkey and all of the fixin’s! 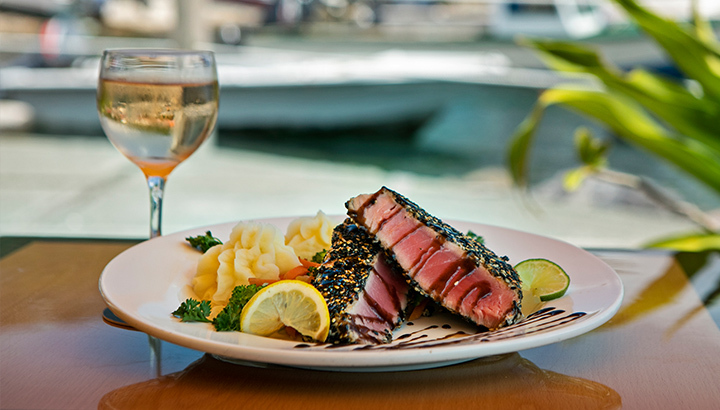 What makes a destination seafood restaurant and steakhouse in St. Thomas? Our dedication to local cuisine and craft! When you’re done digging in to our expansive menu of delicious options, enjoy a fresh-made dessert. Or, grab your favorite drink, imbued with rum, gin or vodka made by a local distiller. We can even tailor our menu options to support our local customers with allergies, making them gluten-free wherever possible. We invite you to enjoy our full menu, or just stop in for happy hour to enjoy specials like $8 buckets of beers, $2 well drinks or $4 call drinks. Whatever brings you to Hook Line & Sinker, we hope you’ll be back! We offer a unique seaside dining experience. In fact, our fresh fish are caught just 10 feet from our restaurant! You can’t get any fresher than that! Our cooks and chefs have all been with us for more than 25 years. Their dedication to their draft results in some of the best food on the Islands. We aim to keep the atmosphere lighthearted all the time. Turn to us for television sporting events, live music and more. We offer dine-in, carry-out and delivery options. Delivery for lunch or dinner can be ordered through St. Thomas Direct (3rd party). In the mood for fresh fish? Looking for a little Caribbean Cuisine? Hook Line & Sinker is the place to dine for all this and more! Visit today to ask about dining and drink specials.